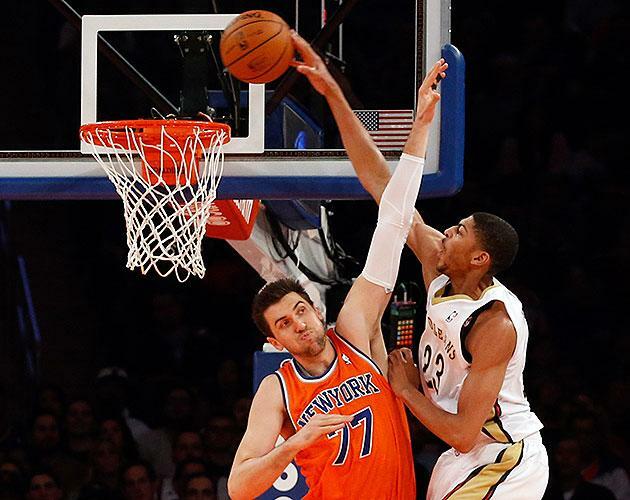 Well, this is a bummer — Anthony Davis, the New Orleans Pelicans forward whose sensational start to his sophomore campaign has been one of the most compelling stories of the early NBA season, suffered a non-displaced fracture in his left hand during the Pelicans' 103-99 road win over the New York Knicks at Madison Square Garden on Sunday. "I am hoping it is a short-term thing, so I can get back on the floor," Davis said. "I felt pain. I didn't think it was going to keep me out. I am happy that my team battled for the whole 48 (minutes) and got that W."
That win — owed in large part to a game-high 31 points on 7 for 11 3-point shooting by floor-spacing big man Ryan Anderson — got the Pelicans back to .500 on the season, but if Davis misses an extended period of time, Monty Williams' squad figures to have a tough time staying there. After a rookie season short-circuited somewhat by an array of injuries — an early concussion, a late-November left ankle tweak, a post-All-Star-break left shoulder sprain and a season-ending sprained medial collateral ligament in his left knee — Davis got off to a roaring start this year, leading the Pelicans in scoring and rebounding while shooting just under 50 percent from the floor and 85 percent from the free-throw line on nearly six attempts per game. He's added some off-the-dribble cleverness when facing up from the elbows and has extended the range on his jumper, hitting just under 39 percent on midrange shots, up from 30 percent as a rookie. He's firmly established himself as one of the league's most devastating offensive players when catching the ball in motion, ranking No. 2 in the NBA in points scored per play finished as the roll man in the pick-and-roll and when receiving the rock in transition, according to Synergy Sports Technology's game-charting data, which makes him an ideal big man for a Pelicans team playing at a considerably faster pace this year (nearly six more possessions per 48 minutes, according to NBA.com's stat tool) after the additions of guards Jrue Holiday and Tyreke Evans. Add it all up, and Davis is posting the league's second-highest Player Efficiency Rating — an admittedly imperfect but still somewhat useful catch-all metric — through 16 games, trailing only reigning Most Valuable Player LeBron James. And that doesn't even factor in his defense. While he struggled a bit to translate the defensive dominance that made him a terror during his lone season at Kentucky to the NBA as a rookie, Davis has emerged as a legitimate deterrent in Year 2. He leads the NBA in both blocks per game and block percentage, which measures the share of his team's defensive possessions that he ends with a swat. He's also influencing shots he doesn't block, holding opponents to a 41.8 percent shooting percentage on tries at the rim, the 11th-lowest mark among big men who average more than 20 minutes per game, according to NBA.com's player-tracking data. New Orleans has been just south of middle-of-the-pack in terms of points allowed per possession with Davis on the floor and just north of bottom-of-the-barrel when he's off it; with backup center/shot-blocker Greg Stiemsma still sidelined by a sprained left knee, missing Davis for any extended period of time would make the Pelicans perilously thin in the middle and susceptible on the defensive end, while also taking away the offensive focal point who helps create open looks for Anderson and a rejuvenated Eric Gordon, and generates drive-and-dump opportunities for Holiday and Evans. That lineup was starting to score like gangbusters in increased minutes; now, it looks like Williams and company will have to find more ways to generate offense without Davis drawing defensive attention on every dive to the rim. While any absence for Davis presents a gray cloud over Pelicans fans, the silver lining is that the fracture is both non-displaced (meaning the pieces of the broken bone are still lined up properly) and in his non-shooting hand, which (hopefully) should limit his shelving somewhat. Still, with the Pelicans staring down an upcoming slate featuring eight current playoff teams and the Memphis Grizzlies over the next nine games, this isn't exactly an opportune time for New Orleans to be without its best player; any significant slippage over the next few weeks could put the Pelicans in a deep hole when it comes to fighting for a playoff berth in a brutal Western Conference that features 12 teams with .500-or-better records and one (the sliding Minnesota Timberwolves) within one game of all-square.